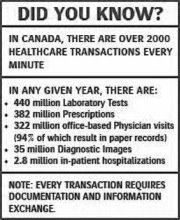 In Ontario, very few hospitals can share their disparate Electronic Health Records (EHRs) between providers or with patients/clients. To facilitate sharing of patients’ EHRs among physicians and clinicians, The Credit Valley Hospital (CVH) joined William Osler Health Centre (WOHC) and Halton Healthcare Services (HHS) to establish an electronic clinical portal. Trillium Health Centre (THC) and Headwaters Health Care Centre (HHCC) have also entered into this partnership and will go live in the next few months extending the Rapid Electronic Access to Clinical Health (REACH) EHR initiative to all hospitals within two LHINs serving a catchment area of 1.8 million Ontario residents (about 5% of the total Canadian population). This existing collaboration between six physical hospital sites in the Peel and Halton regions and two LHINs – the Mississauga Halton LHIN (MH LHIN) and the Central West LHIN (CW LHIN) – is unprecedented and a landmark partnership in the Province of Ontario. The REACH Clinical (EHR) Portal enables all associated sites’ clinicians to have instant access to longitudinal patient health information including but not limited to allergies and alerts, lab and diagnostic test results, diagnostic images and reports, pharmacy data, transcribed notes, scanned images, progress reports, and other important health-related information. A thorough Privacy Impact Assessment was also perforemed to ensure REACH meets all Ontario privacy standards. At each constituent hospital, patient data is easily accessed today through our secure network solution and consolidated into one customizable, patient-centric view. Based on a federated data-model, patient data remains in its original format on its respective (legacy) vendor IT system, allowing for all systems to be leveraged across multiple domains, rather than replacing them. Additionally, using a federated data-model ensured implementation of the REACH clinical portal was extremely fast and inexpensive especially when compared to other more complex solutions. The partnership between REACH Hospital stakeholders not only enhances patient safety and satisfaction, it provides an intuitive web-based interface that is accessible anywhere. The REACH portal was created using MEDSEEK in partnership with Agfa HealthCare, both leading providers of enterprise-wide e-Health solutions. This simple portal solution is also vendor-agnostic, so the system is compatible with almost all health information systems, diagnostic imaging vendors, and other suppliers. 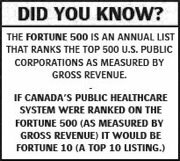 “Over 160 interfaces are available on a plug-and-play like basis,” says Dan Germain, Vice President, Chief Financial Officer and Chief Information Officer at CVH. To date, the REACH EHR portal is getting over 9,000 views per month within the Mississauga-Halton and Central West LHINs---with one-third of those views made by Physicians looking at patient data from other hospitals. Over 1,000,000 outpatient visits and 100,000 discharges per year are now available within the REACH portal at this time. “The clinicians who are accessing patient information via the REACH portal love it,” says Germain. The portal has the ability to consolidate information about a patient/client from other sources (e.g., Community Care Access Centre’s), but currently, the focus is to bring more hospitals on stream and ensure as much clinical data is contained in the portal as needed. The Mississauga-Halton and Central West LHIN's are fortunate in securing both the commitment of all regional hospitals to join the REACH portal, and also engaging a vendor solution that was both comprehensive and transferrable outside the walls of any specific site. This collaboration between regional hospitals is a stepping stone toward the overall e-Health goals for the province of Ontario, for example, building a standardized methodology to identify each unique patient and then consolidate electronic health care data from a variety of sources (e.g. hospitals, private laboratories, pharmacies, nursing homes.) It should also be noted that Hamilton Health Sciences and the Scarborough Hospital are also using the Medseek portal (distributed by Agfa HealthCare in Canada.) Ottawa-area Montfort Hospital has also signed on, but have not gone live yet. 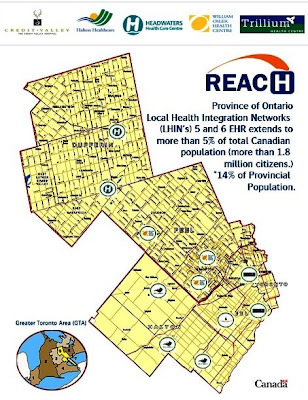 REACH will be ready to plug-and-play into Provincial EHR Initiatives once available. We keep hearing from patients that they want to be more involved in their own health care. "Providing patients with electronic access to their health record and wellness information– that’s our next goal,” says Germain. “We can make our collective vision happen a bit sooner – anything is possible." Now that our disparate Clinical Information can be accessed and leveraged, a REACH Patient Portal is on the horizon. Germain explains that this Patient Portal initiative will be especially beneficial to those managing chronic disease prevention and that it is imperative that that patients have access to their own health records in a secure manner, as well as access to reliable health and wellness information. Dan Germain is the Vice President, Chief Financial Officer and Chief Information Officer at The Credit Valley Hospital.